When Western settlers crossed the continent, they were awed by the sea of head-high grasses they encountered. Of the 400,000 square miles of wildflower-splashed tallgrass prairie that once covered North America, less than four percent remains today, mostly in the Flint Hills of northeastern Kansas. America’s shortgrass prairie has fared better and still covers tens of thousands of square miles of the Great Plains, although much of that habitat has been altered, stressed, and depleted by human activity. The sights, sounds, and stories of the prairie shaped an important part of our country’s history, culture, and legacy. 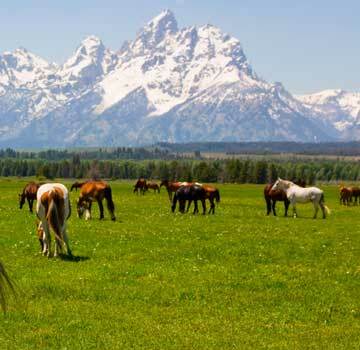 Dig deeply into this rich remnant of the American heartland, with expert guides and interpretation on trips from Off the Beaten Path. 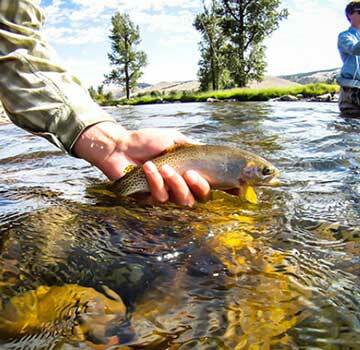 OBP offers many ways to travel: Small Group Adventures, Fly Fishing Expeditions, Ranch Vacations & Custom Journeys . You can explore more than 40 miles of hiking, walking, and nature trails at Tallgrass Prairie National Preserve. Each offers a unique perspective and experience, and might take you to scenic vistas, or give you close-up views of grasses, wildflowers, wildlife, birds, and pure prairie landscape. 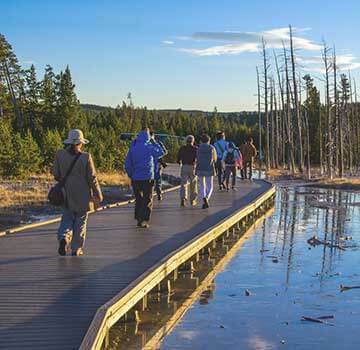 Custer State Park is crisscrossed by historical trails forged by early pioneers, ranchers, and loggers, and offers great opportunities to explore various features of the shortgrass prairie ecosystem. It’s also fun hiking here, with trails through odd granite spires and ponderosa pine forests, across creeks, to waterfalls, and up to a “Little Devils Tower.” Speaking of which, at the real Devils Tower National Monument in Wyoming, you can walk a paved trail that’s just under a mile and a half and goes all the way around the famous laccolith. Other Devils Tower trails offer great views of the Tower and surrounding Belle Fourche River valley. Travelers are often surprised by the wonderful wildlife watching opportunities in prairie parks and preserves. Each bird, mammal, and insect has a role in the balance of the ecosystem. Walking through the Tallgrass Prairie National Preserve in Kansas you might see coyotes, bobcats, badgers, white-tailed deer, fox squirrels—or some of the nearly 150 bird species adapted to prairie life, such as white pelicans, Swainson’s hawks, greater prairie chickens, northern bobwhites, snipe, nighthawks, dickcissels, a number of warblers and sparrows, western meadowlarks, bobolinks, and yellow-billed and black-billed cuckoos. The preserve is also home to a genetically pure herd of bison—the same all-AmericanBison bisonthat live in Yellowstone, and a satellite herd to the bison at Wind Cave National Park bison in South Dakota. While there are no prairie dogs at the Tallgrass Prairie reserve, you’ll find whole towns of them in the shortgrass prairie habitat of Custer State Park in the Black Hills of South Dakota—along with the biggest native bison herds outside of Yellowstone. In fact, the park hosts an annual Buffalo Roundup and Arts Festival in September to corral, sort, and brand the park’s approximately 1,300 bison. It’s a spectacle! It might surprise you, but Custer State Park has recently been recognized as one of the Ten Best Wildlife Destinations in the World. Most of the park’s animals can easily be seen from park roads and trails, and along with the bison and prairie dogs, your checklist will include mule deer, pronghorn antelope, mountain goats, elk, coyotes, and bighorn sheep. Burros aren’t wildlife, obviously, but burros also live in Custer State Park and are a perennial visitor favorite. With its variety of habitats, Custer State Park is also a great birding destination and a rewarding spot for dedicated bird-watchers. Avian residents and seasonal visitors include golden eagles, prairie falcons, northern goshawks, gray jays, wild turkeys, mountain bluebirds, western tanagers, upland sandpipers, and a number of sparrows. Wildflower walks are one of the great pleasures of visits to the prairie. The Flint Hills tallgrass prairie is bursting with over 800 species of wildflower, which start blooming in March and continue through October. Peak times for wildflower diversity are mid May through June, and again in August through mid September. The amount of rain and sun in any given year affect the abundance of wildflowers, and every year is different, but look for common sunflower, prairie blazing star, cream wild indigo, prairie coneflower, purple prairie-clover. buffalo gourd, evening primrose, and so many more. The tallgrass prairie ecosystem supports more than 70 species of grass, many of which can reach heights of six to eight feet. The “Big Four” grasses of the tallgrass prairie ecosystem are big bluestem, little bluestem, Indiangrass, and switchgrass. In the shortgrass prairie region, Jewel Cave National Monument and Wind Cave National Park are also great places for wildflower walks. Flowers bloom May through September, and can include black eyed Susan, pasqueflower, purple coneflower, sego lily, Mexican hat, horsemint, blue flax, gayfeather, Wood’s rose, purple prairie clover, blazing star, prairie sunflower, and blanketflower.